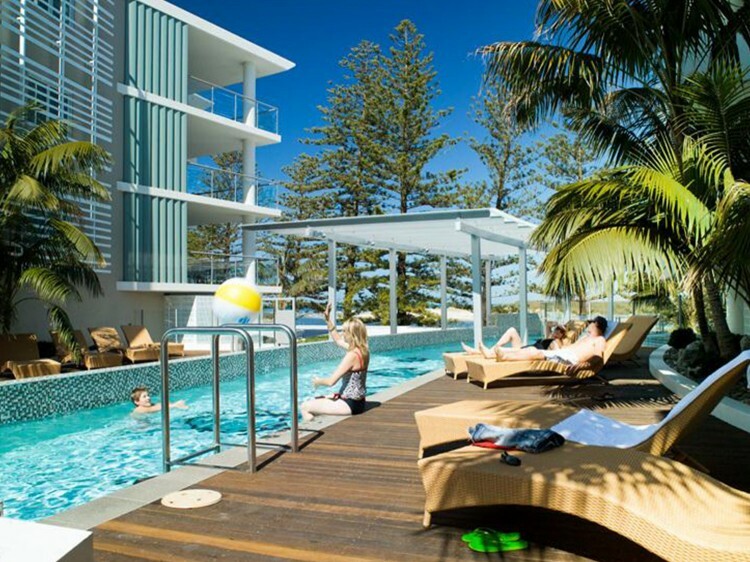 Opening its doors in 2009, Rumba Beach Resort has redefined premium accommodation in Caloundra. Located on the beautiful Sunshine Coast, Rumba Beach Resort offers the perfect family or couples vacation and guarantees a relaxing holiday experience like no other. 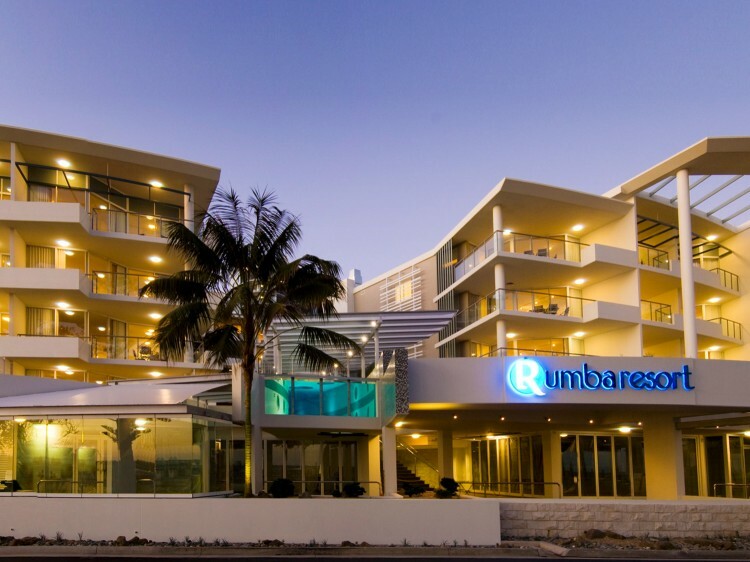 Rumba brings to the Sunshine Coast the finest boutique all-suite accommodation and with the most well-appointed guest apartments in the region, integrating the atmosphere of a tropical resort with the convenience of a beachfront position; whilst still being right in the heart of town. Low-rise towers intimately surround two beautiful pools and a giant Jacuzzi and create a feel of exclusivity. Black basalt pillars and pure white stone flooring reflect constellation lighting throughout the resort’s Reception. Water drenches down from a rain shower into a simulated seabed in a main foyer. This is just one of Rumba Resort’s beautiful places to be, either people watching by day or relaxing quietly at night. Setting the benchmark in 1, 2 & 3 bedroom Resort Spa Suites and Ocean Apartments, guests enjoy all the pampering features that define first class resorts around the world. In room Denon home theatre, free WiFi, king size beds and spa bathrooms all come as standard. Fronting Caloundra's newest attraction, the all new Waterfront Boardwalk and Coastal Pathway, Rumba is also home to outstanding restaurants and cafes. Spend an afternoon in the giant Jacuzzi or endless strokes in our glass-bottomed heated lap pool that rises above Rumba’s restaurant plaza - mere examples of how to let a lazy afternoon pass by on your beachfront escape. 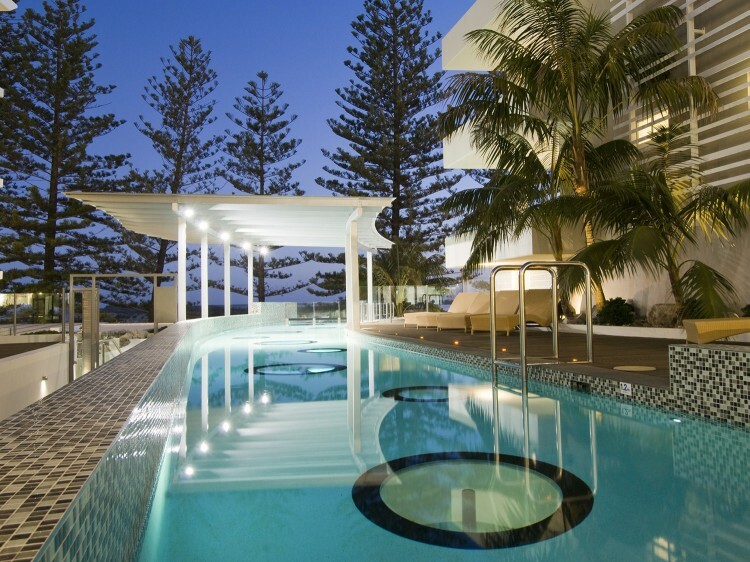 Awarded Caloundra’s best hotel, Rumba Beach Resort aims to deliver outstanding service and a first class guest experience every time. Feature fully equipped designer kitchens following through to an open-plan living and dining area and private balcony. A separate king bedroom with wall mounted TV and 2 person spa ensuite come as standard. Feature fully equipped designer kitchens following through to an open-plan living and 4 person dining area and private balcony. The main Bedroom features a King Cloud™ bed and ensuite with 2 person spa bath. The second bedroom offers a choice of comfortable king or twin bedding. Feature fully equipped designer kitchens following through to large format open-plan living and 4 person dining area and private balcony. The main Bedroom offers water views and direct balcony access. It features a King Cloud™ bed and ensuite with 2 person spa bath. The second bedroom offers a choice of comfortable king or twin bedding. Feature fully equipped designer kitchens following through to large format open-plan living and 6 person dining area and private balcony. The main Bedroom offers water views and direct balcony access. It features a King Cloud™ bed and ensuite with 2 person spa bath. The second bedroom offers a choice of comfortable king or twin bedding whilst the 3rd bedroom provides twin accommodation only. Rumba Resort has a No Party Policy which is strictly enforced for the comfort and security of guests.